This project was undertaken for the cover design of a PhD Thesis. As the thesis title suggests, the contents are about properties of light and interaction of light with materials. 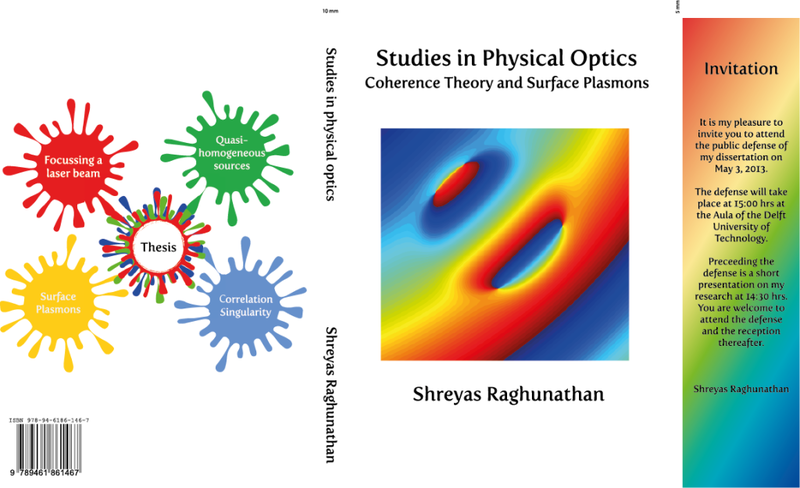 The cover page contains at its heart an image depicting correlation singularities described in the thesis. Besides the obvious scientific significance, the image is colourful and engaging. The back page of the thesis tries to show major topics dealt within the thesis. Focusing a Laser beam is written inside a red blotch, as 633nm He-Ne red laser was used for experiments. Surface Plasmons has been inscribed in a Yellow blotch, as a gold surface is required for the generation of surface plasmons. Two other complementary colours (red and blue) were used for the remaining research topics. The central blotch was creating by merging the colours of the research bubbles, hence creating white, symbolising the thesis.